From 1898 to 1934, the United States created, trained and equipped small military/constabulary forces for five Latin American countries: Cuba, Panama, Haiti, the Dominican Republic and Nicaragua. Each force was expected to provide virtually all aspects of the nation's security, was designed to be apolitical, and was meant to reduce opportunities for corruption. It was further hoped, if not expected, that these forces would provide the stability needed to avoid future U.S. armed interventions. The forces thus created, far from becoming supporters of democratic stability, spawned predatory dictatorships. 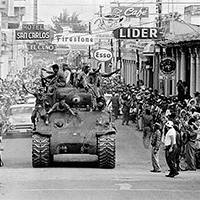 The United States thus found itself intervening again &mdash; twice with military force in Haiti and once in the Dominican Republic, as well as one major and several minor interventions in Panama, several limited interventions in Cuba (plus the indirect efforts of the Bay of Pigs operation), and indirectly in Nicaragua via the Contra project. In all but the Dominican Republic, the created forces were destroyed by Marxist revolutionaries in Cuba and Nicaragua and by U.S. military intervention in Haiti and Panama.